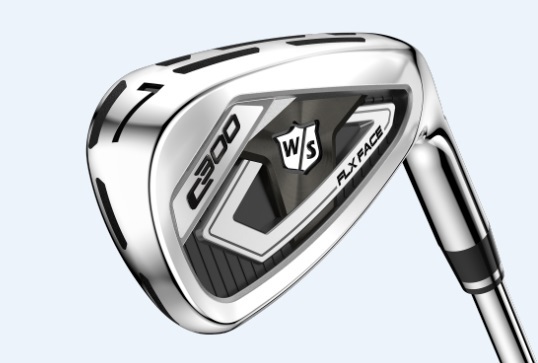 Wilson Staff C300 irons review: double the Power Holes in 2018 - how does it improve performance? Wilson Staff are renowned for offering value for money. In recent years, their irons have offered decent performance at significantly lower price points compared to their competition. In 2018, the C300 irons continue in similar form. At £599, they’re by no means in the budget category, but are well below the cost of some other leading wrenches on the market. We tested the C300 irons on the range and on the course at the Shire, using a SkyTrak launch monitor and TaylorMade TP5 golf balls. This could be a deal breaker for some. The Power Holes on the top of the club may be too much of an eyesore for certain golfers, but we didn’t mind them too much. Definitely not improving the looks, but it didn’t have too much effect on us. We thought the the topline would have to be mega oversized to fit the holes in, but they’re no bigger than what you would find in other game improvement irons. The sole does look quite busy with the two rows of holes, but you don’t have to look at them at address. The graphics on the back of the club have no red splashes like the D300, and we preferred this aesthetic. For a cast iron we were impressed by the feel. Relatively soft, and decent even if you miss the centre. The long irons do feel a tad hollow. Spin has come down compared to the D300 irons, around 500 revs in the seven iron. We found this gave us a little extra distance. If you are a naturally high spin player, then this could help you but conversely if you struggle to get the revs up then you may have issues stopping the ball on the greens with super low spin. The double row of Power Holes - designed to increase the trampoline effect - seem to work wonders in the forgiveness stakes as we were getting loads of help all over the face. Particularly from low on the face and towards the toe, we were really impressed with how much forgiveness we got. An excellent set of irons at this price point. We see these as suited to mid to higher handicap players, as there was a certain degree of workability on offer. There are more forgiving irons out there if that’s all you are looking for, but these also offer a great feel and looks. Offers good levels of distance, and is low spinning. Overall, an appealing blend of performance in an attractive package. Head to the Wilson Staff website for more.